To reach Tunkwa Lake from Kamloops, BC, travel west on the Trans Canada Highway (Hwy #1) for 11.4 km. (7.1 miles) turn south onto the Coquihalla Hwy. (Hwy #5). Take exit 336 off hwy 5, turn west (right) on the Meadow Lake Rd. and travel through the community of Logan Lake. Watch for the turn off to Tunkwa Lake and Leighton Lake on your right hand side. Tunkwa is found 14.5 km. (9 miles) north of Logan lake. 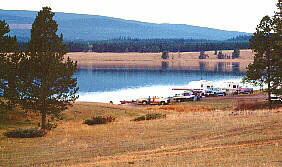 Resorts & Campsites: Tunkwa Lake Provincial Park encompasses both Tunkwa and Leighton Lakes. One resort is present on the east side of the lake, offering both cabins, campsites and a store. Fishing Report: Chosen as one of the lakes that hosted the 1993 world fly fishing championship , Tunkwa Lake is simply a great fly fishing lake. Tunkwa is considered to be one of the richest of the interior lakes, it produces an absolutely huge chironomid hatch in the spring. Leeches, shrimp, and water beetles are the predominate invertebrates, however, damsels, dragons and sedges are present in good quantities. Spring and fall months offer the best fishing. Algae growth during the hot summer months makes fly fishing difficult so it is reccommended to fish deeper with shrimp or leech patterns at this time. Tunkwa Lake produces good catches of rainbows up to 4 lbs. and better. Fall, just after the 1st. freeze while fish are stocking up for winter can offer exceptional fishing especially for the bigger rainbows. Visit Fishbc.com for angling information! 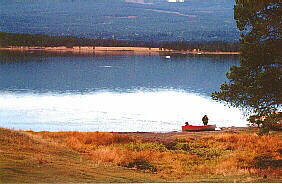 Viewscape: Tunkwa Lake is situated on the Thompson Plateau amongst rolling hills of thick pine stands and open meadows. This is open range land where you will see herds of cattle moving and feeding at their leasure. Shoreline: Many bays, peninsulas and shallow patches at the north and south ends. Tunkwa is heavily weeded throughout with potamageton and chara and can easily be described as one large shoal. Several streams feed the lake on the south side. The fishing camp and campsites are on the east side along with some private residences. Leighton Lake - Leighton Lake, 50 ha. (124 ac.) 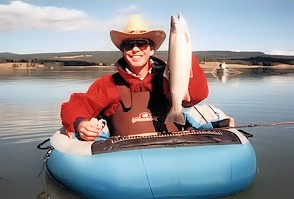 is located at the north end of Tunkwa Lake, and like Tunkwa is simply a terrific fishing lake. An incredible chironomid hatch in early spring jump starts this lake followed by an excellent hatch of damsel flies in early June. Of course like Tunkwa all other insects are present in this very rich lake. Leighton has many shallow bays, flats and 2 small islands on it's east side, making it a fly fishers dream. Rainbows go up to 4 lbs., however, don't be surprised at hooking into a 7 or 8lb. monster.